This week, the FBI sent out a warning that a strain of malware known as "Beta Bot" can turn off your antivirus, stops access to the websites of antivirus vendors so that your antivirus program cannot call home for fresh definitions, and steals your user name and password when you log into your financial institutions, e-commerce sites, online payment platforms, and social networks. The Beta Box malware masks itself as the "User Account Control" message box, but when you click on this box, it will infect your computer. 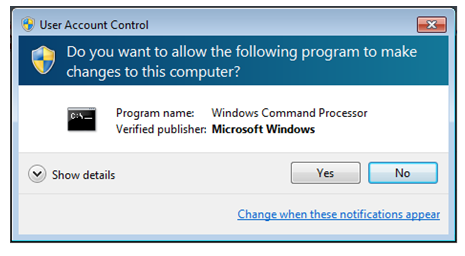 If the above pop-up message or a similar prompt appears on your computer and you did not ask for it, or are not making changes to your system's configuration, do not authorize this fake "Windows Command Processor" to make any changes. Beta Bot is commercial malware, meaning it was made by cyber criminals to be sold to other cyber criminals who can then use it to steal your personal information. It also means the quality is very high, and it's hard to get rid of when your PC gets infected. So have another look at the screenshot above, as it is much easier to prevent this infection than cure it which will likely require a trip to the helpdesk or your computer retailer. The best way to get rid of this popup is to press ALT-F4 to make it go away. You can also click on the red X at the top right, but do not click on the Yes or No at the right bottom.